The arrangement helped the troubled school stay afloat a bit longer, but Stahl stood to benefit too, through interest she could collect on her loans. She was also probably eligible for a tax deduction for an $8 million gift she also made to the school in 2015. Previously, when Brown worked at Suffolk University in Boston, Stahl helped bolster that school, too, documents show. “The entity that loaned Mount Ida $16.5 million is listed publicly as Carlson Property LLC,” Krantz reports. The loan resulted in Carlson Property holding a mortgage for around 15 acres of the school’s campus. “Brown’s name does not appear on any public filings by the college,” says Krantz, “nor does the name of his client, but after questions from the Globe, trustees acknowledged that Stahl’s trust funded Carlson.” But Brown is a trustee of Stahl’s personal trust. All of this raises many questions. Scott Harshbarger, a nationally known expert in the governance of nonprofits and a former Massachusetts attorney general, said, “This is the president of an institution with a private financial interest”—which, in and of itself, poses a problem. Harshbarger adds that there should have been public disclosure around the loan and the tangled relationship that underwrote it. “There is a whole trail of insider dealing here that could possibly be justified as in the best interest, but there’s no core documentation or disclosure so that anybody independently can be satisfied that that’s the case,” Harshbarger said. Then, there are the questions of whether or not Brown treated the donor fairly. “If I were one of her heirs, I would really be upset,” said Lawrence Zicklin, a former managing partner at the investment management firm Neuberger Berman and expert in business ethics. Despite the fact that Mount Ida’s trustees have said they knew of the relationship and that it had been disclosed before hiring, James Finkelstein, professor emeritus of public policy at George Mason University and an expert on the role of university presidents, calls the relationship both unusual and troubling. The ties among Brown, Stahl, Suffolk, and Mount Ida stretch further. Jason Potts, the CFO at Mount Ida, worked at Suffolk under Brown as director of finance and real estate. Stahl’s grandson, Isaac, is a tennis coach at Mount Ida. Isaac at one point ran a real estate business with Potts. Robert Dannin, a Mount Ida trustee, is the husband of one of Stahl’s daughters. From 2001 to 2008, Brown served as senior counsel at the national law firm Holland & Knight. Documents show that over the years, the firm continued to do business for Stahl. 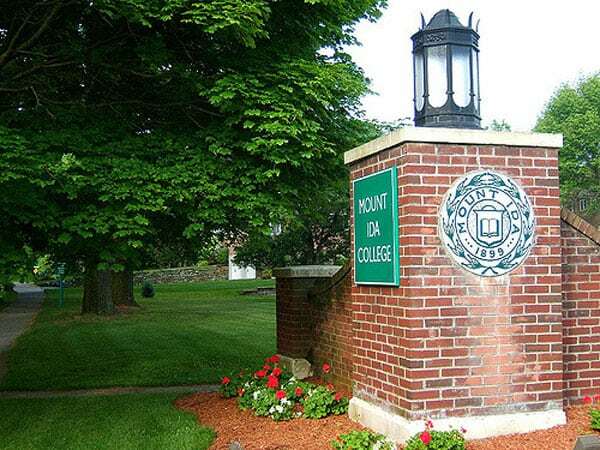 The firm represented Mount Ida in the recent sale of its Newton campus to the University of Massachusetts Amherst. Mount Ida also agreed that Holland & Knight could represent Carlson when it loaned money to the college, according to the firm. Stahl seems to have followed Brown through his career as a college administrator. In 2004, when Brown was a professor at Suffolk, Stahl purchased an $85 million office building in downtown Boston and leased it to the university. The building, 73 Tremont St., has now become the school’s main building, with the president’s office on the top floor, overlooking Boston Common. A gold plaque outside identifies it as the Rosalie K. Stahl Center. But experts also found the terms of the 73 Tremont deal unusual. The Tremont Street building is owned by an LLC, registered to both Stahl and Brown, to which Suffolk continues to make payments. It is unknown whether Brown profits personally from this. Do they have a policy? Was there a violation of the policy? We can’t answer any questions without seeing it. There’s no reasons for any nonprofit to withhold that information from the public. It could be that when this president was hired he fully disclosed his relationship and there was language in his contract that waived the conflict. Unfortunately, in the absence of transparency people tend to assume the worse. Stephen Joel Trachtenberg, a professor of public service and president emeritus of George Washington University, agrees that the details are critical in order to make any judgment about whether all is above board.